Cyr held-out 135 pounds in front, knuckles up. Cyr held-out 135 to the side, palm up. Cyr held-out 129 in front. Apollon held-out 154 to the side, with a slight body-bend. Apollon snatched and held-out to the side a ringweight of 176. Apollon held-out to the side correctly a square weight on the hand o 110.23 pounds, and with a slight body-bend, 176.37 pounds. All these lifts being made with one hand. The reader who has a copy of the book “Super Strength’ should turn to plates 29 and 30 for illustrations of the One-Arm Hold-Out to the front and to the side. There are certain poundage possibilities of various lifts in relation to one another. Willoughby’s table of these ratios appeared in an issue of Roger Eells “Vim” magazine. Together with his table of strength relative to size, it gives us a means of testing some of these stories. Certain alleged feats of strength have been illustrated as “incredible but true”. One drawing shows us Louis Cyr holding-out in front, knuckles up, 135 pounds. Some writers on weight lifting sneer at the newspaper reporter who hears that a lifter pressed 200, snatched 200, and jerked 300, and prints a story that he lifted 700 pounds overhead. How ignorant ordinary people are about the possibilities of strength! Yet a 135-lb. hold-out in front with one hand is equal (equivalent in merit) to a two hands Olympic Press of 738 pounds, believe it or not! It is also equal to a Clean & Jerk of 958, a pullover at arms’ length of 434, and a bent-press of 879. Pounds, not ounces. Why, then, are those who accept this feat of Cyr’s as true, so skeptical of the claims of R.C. Weeks, who claimed a mere 524 Clean & Jerk, 230 pullover, and 463 bent-press? These are puny lifts compared to Cyr! If Cyr muscled-out 135 to the SIDE, palm up, as others have reported, the lift was equal to an Olympic press of 490. Could Cyr have pressed 490 pounds? Students! Similarly, the reported hold-outs by Apollon of 154 and 176 to the side, even if done with a slight body-bend, would be equal to Olympic presses from 467 to 535 pounds. A correct hold-out o 110 with square weight on the hand is equal to a mere 396-pound Olympic Press. If Cyr had held-out in front, not 135, but only 59 pounds, it probably would be thought unworthy of mention by some writers. Yet it would smash the official world’s record (which is 58.42 pounds), and would be equivalent to an Olympic Press of 320 pounds, which is better than the best lift of the best presser today. The official British amateur record for a front hold-out with TWO hands is 91 pounds, equivalent to 46 pounds with one hand. In the crucifix, or hold-out to the side, palms up, the British record is 145, or 73 right and 72 left. The official world’s professional record for holding-out a square weight on the hand is 83.77 pounds. More can be lifted in this style than with dumbbell or ring weight. We have considered impossibilities; now for possibilities. Willoughby made an estimate of Apollon’s probable strength in the two hands curl and the one hand dead lift. If this can be taken as a measure of his general strength, we might expect a crucifix of 179, or 90 right and 89 left, or 97 held correctly on the right hand with square weight. 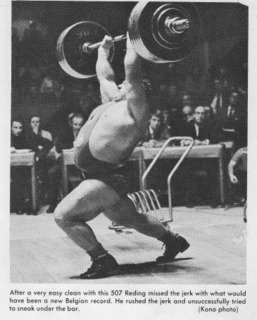 Grimek has done 285 in the Olympic Press; this is equal to a Military Press of 261. Cyr is credited with a “perfect Military Press” of 300. This is 1.15 times Grimek’s estimated press. Grimek is reported to have held-out to the side two 80-pound bells. 1.15 times 80 is 92; hence we should expect Cyr to be able to hold-out a 92-pound dumbbell. Or you can do it this way. The poundage possibility of the one-arm hold-out to the side (in correct form) is .300 times the two hand Military Press. Grimek is supposed to be especially good at holding-out weights, and we do in fact find that his 80-pound hold-out is .307 times his estimated 261 Military Press. Suppose Cyr to be just as good in proportion as Grimek. .307 times Cyr’s 300-pound Military Press is 92 pounds. Still a third way. Refer to Willoughby’s table of relative strengths. Grimek’s weight divided by height equals 2.76 with a relative strength of 472. Cyr’s weight divided by height is 4.47 with a relative strength of 537. 472 into 537 gives 1.14, which means that if Cyr was a strong in proportion to size as Grimek is, we should expect him to lift 1.14 times what Grimek lifts. Grimek held-out 80 pounds; 1.14 times 80 is 91. We should expect Cyr to hold-out 91 pounds. As a matter of fact, Cyr has been credited with a crucifix of 182, 94 in the right hand and 88 in the left. This is a possible lift, and if done officially it would be the best performance on record. Incidentally, Hackenschmidt is credited with a crucifix of 90.38 and 89.06 pounds, “in the less strictly correct style” as he himself mentions. Willoughby doubts that Hackenschmidt could have held-out correctly, that is, in a strict military position, with body erect, and arms rigidly straight, more than 75 pounds in each hand.